I have always loved cooking and was lucky enough to grow up in a household with a mum who loved to cook and cooked really good, wholesome foods mainly passed down from her mother before her. I think my subsequent career in the food history all came about because of the love of food that I picked up at my mother’s and grandmother’s knee as a very small child. A trip to stay with my grandmother was always much appreciated as I knew that I would be eating, and helping my grandmother to cook, some fantastic but simple and often frugal meals. At the bottom of my grandparents garden was an apple tree that every autumn produced a fine selection of baking apples and one of my favourite desserts at this time was one of my grandmother’s delicious baked apples that she stuffed with raisins or dates and that we had served with thick , smooth, creamy and sweet custard – ah happy memories! Even in today’s society with desserts like sticky toffee pudding being more popular there is still a place for the fantastic baked apple. Luckily baked apples really are one of the easiest puddings to make as well as being really delicious and very economical – especially in the autumn when Bramley apples (which are best apples to use for this recipe as they turn out light and fluffy) are so plentiful. This recipe is just the way that my grandmother used to make the dish and it is lovely with either hot creamy custard or with a big dollop of vanilla ice cream – the contrast in temperature between the hot apple and cold ice cream works a treat. 3. Score around each apple around 1/3 down from the top – be careful not to cut through the apple – just the skin. 4. Place the apples in a shallow baking dish, base down . 5. Mix together remaining butter, 3oz of the sugar and fruit of choice. 6. Stuff each apple with the fruit and butter mixture. 7. 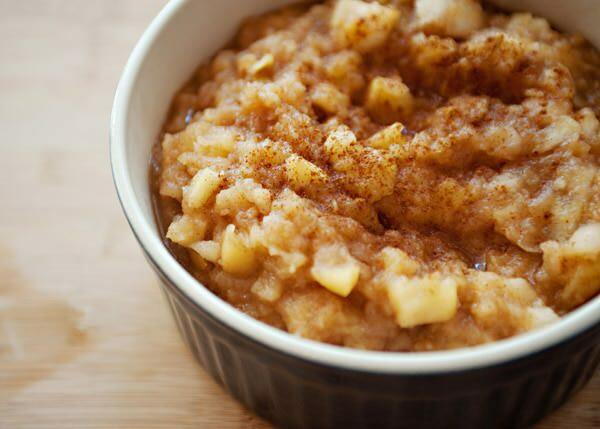 Sprinkle remaining sugar with the cinnamon over the top of the apples . 8. Bake in the preheated oven for 15 minutes, until the sugar begins to caramelise and the apples are tender. This is true comfort food and I’m sure that you’ll love this dish.